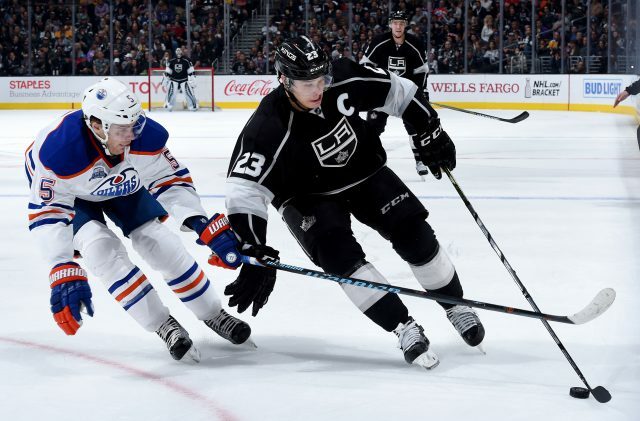 It was a fitting inverse to the end of the road trip: Instead of stringing together strong performances and losing, the Kings picked up two points in a game in which they weren’t at their best by virtue of a 6-4 victory over the Edmonton Oilers. Even if it’s not always whether you win or lose – it’s whether you’re winning or losing – the team rallied for an important win on a night in which the Anaheim Ducks erased a three-goal deficit to win as the top-heavy Pacific Division race remained tight. 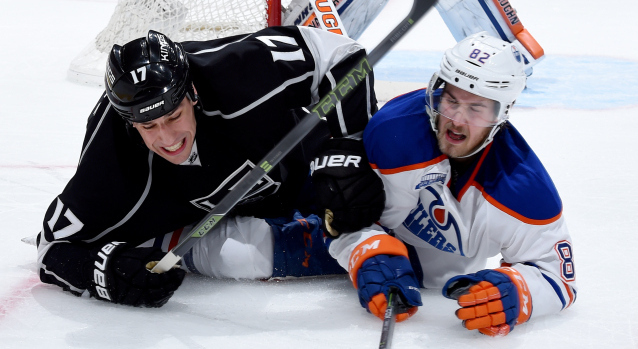 The Kings scored six times in using a combination of their opponent’s depleted defensive corps and shaky goaltending to break through offensively; on the defensive end, there were more individual mistakes than would normally be associated with a team known for its airtight systems adherence and top checking from all the players on the roster. After a loosey-goosey first period that resembled a game from October 26, and not March 26, Los Angeles emerged with a terrific response in the second period, the basis of which was their superior play along the boards. The Jeff Carter line was obviously the game’s most dominant, and through the play of his line, as well as Anze Kopitar’s line, Los Angeles generated multiple situations in which they were able to rotate players into a line change while maintaining possession of the puck through cycles deep in the offensive zone. Andy Andreoff had some good jump for much of the night, and it was fitting that he was able to dig a loose puck free and beat Laurent Brossoit during a portion of a shift in which he was on the ice with Carter and Tyler Toffoli. 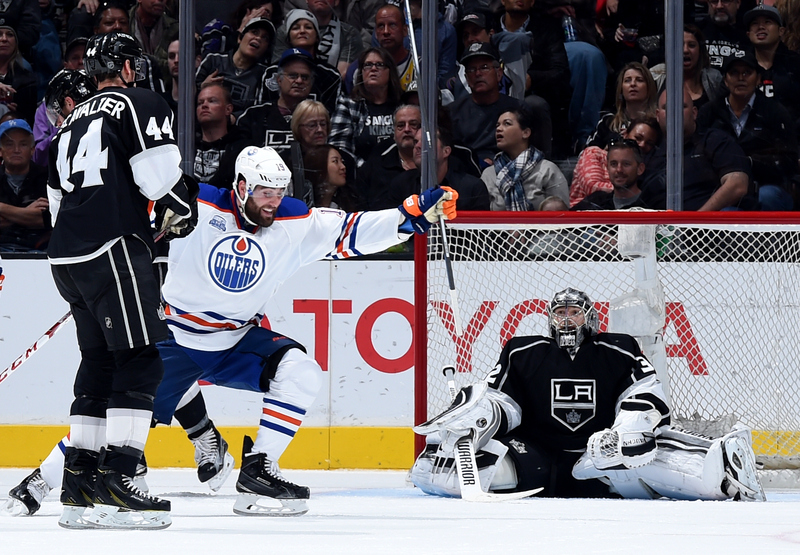 But the three-goal second period was instrumental in advancing from the discombobulated stink of the first 20 minutes as the Kings built up a lead they wouldn’t relinquish, never mind the terrific offensive zone presence brought about by Connor McDavid and Pat Maroon in the third period. So, this Lucic-Carter-Toffoli line. Carter posted outstanding possession rates with his two most frequent linemates last night, dominating in shot attempts when on the ice with both Toffoli (24 CF / 8 CA) and Milan Lucic (20 CF / 8 CA). You’re aware of this; the trio combined for 10 points. If the end of the season can be used to get players’ games in order and gauge alignments that could be used in the playoffs, a statement appeared to be made by the chemistry generated by that trio on Saturday. That may stack a little bit too much offense away from Kopitar, though the Kings’ top center was perfectly acceptable playing alongside Tanner Pearson (15 CF / 10 CA) and Dustin Brown (16 CF / 7 CA). 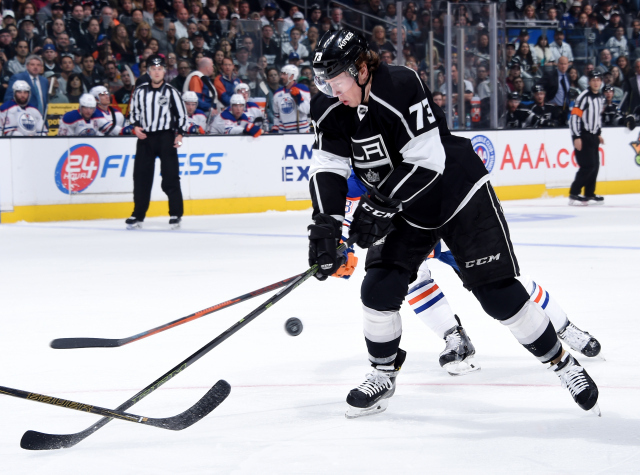 With Pearson’s game having come around since the All-Star break, that’s not a bad option to Kopitar’s left, and should the team get Marian Gaborik back at the start of the playoffs, there’s another fine option to his right. Kris Versteeg, who has also resumed skating, is another player who, in a small sample size, has looked comfortable alongside Kopitar. The team isn’t necessarily a burner offensively, though it has been able to generate offense better than other recent L.A. teams. It was quite good in five-on-five play on Saturday, and there are some intriguing offensive depth options at Darryl Sutter’s disposal – should the team get several of its currently shelved players back.